On May 6, 1981, James Brown appeared with boxing legend Muhammad Ali on the late-night Tom Snyder show to introduce a young and unknown civil rights leader to the world. That young activist was the Rev. Al Sharpton, and he was Brown’s kind of black leader. 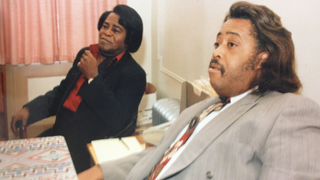 The two had become fast friends during the 1970s and struck up a father-son relationship, with Sharpton adopting Brown’s hairdo, his flamboyant style and even aspects of his radical politics. With the release of the Brown biopic Get on Up, Sharpton—now president of the National Action Network and host of MSNBC's PoliticsNation With Al Sharpton—reflects on the legendary artist’s persona, his run-ins with the law and how the man known as the Godfather of Soul became one of the world’s most celebrated black musicians of all time. The Root: You’ve described James Brown as a man with a large personality. Can you explain what you mean? Al Sharpton: He had a presence probably more impactful than anybody I had ever seen. You could almost feel him coming before he even got in the room. He was short in stature—I was 3 or 4 inches taller than him—but he had that kind of presence. I’ve seen guys that were basketball players cower to him. TR: And you always called him Mr. Brown? AS: He was very insistent that people always address people by their surname. So not only did you have to call him Mr. Brown, you had to call everybody in his organization and everybody in his extended family by their surname. One of the misnomers is that I was his road manager. I was never his road manager. I was in his extended family. He taught me how to promote for the organization I started called National Youth Movement, and he treated me like a son. TR: How often did you travel with him? AS: He would send for me on weekends if he had a big show and I was not busy doing something. He was a very autocratic guy. James believed that the band and the workers were over there and he’s over here with his circle. For example, we would stay at the nicer hotel and the band would stay at a motel across town. The managers would stay with the band. They were not allowed in our circle. Many of the band members that give these interviews on James are embellishing and exaggerating because many of them never saw. TR: How did you deal with James Brown’s personal demons? AS: There were always rumors of domestic violence. I might have seen one altercation. That was in the 1990s. The drugs I never saw. People ask, “Didn’t he act strange?” He was an artist! To me artists act strange all the time. I couldn’t tell if he was high or not. I remember one day his father, Joe Brown—I spoke at his funeral—said to me that Junior (he called Mr. Brown “Junior”) was not going to let me see the bad side of him because you don’t bring a kid in, respect him as a preacher and protect him, and then show him your downside. If he knows I’m admiring him, why would he do something I wouldn’t admire? There’s a contradiction there. TR: Was it difficult to visit him in prison? They wouldn’t let anyone see him, not even his wife. Brought me in and sat me in a visiting room, totally empty. About a half-hour later they brought Mr. Brown down, who was not in a jail uniform but civilian clothes. He looked like he was about to go onstage. He was immaculate. I got up and hugged him and told him we were out there protesting and it was wrong and we were going to get him out.